Having a way to compensate for the (stupid) 24 material limit in 3D Studio is always a big request, so here's a script to do just that. The script lets you create material "pages" each having 24 materials. You can then easily switch around the pages, which will bring the materials in the selected page to the Material Editor. Additionally you can rename pages and materials directly from the script and a simple search feature is included. 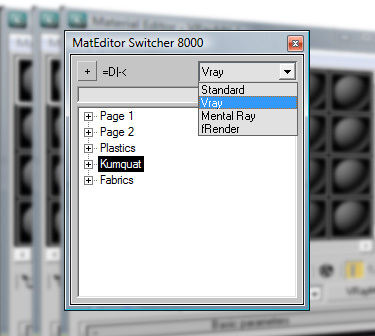 The little dropdown control at the top will let you choose the kind of shader to use when creating a new page. I only included the ones I needed, if you need another one feel free to modify the code or ask below. The material pages will be saved along with the file and they can be retrieved by launching the script again. Feel free to modify as needed and message me if there are any problems. Use at your own discretion =P. CHANGED: the rollout can now be resized horizontally too. Submitted by rs3d on Wed, 2017-04-19 09:25. Too bad this is still not fixed, any alternative to have access to more slots in Classic Material Editor? Submitted by asymptote on Mon, 2015-01-26 05:31. I forgot this didn't work, just spent 3 hours setting up materials and on reload they were trashed by the "unknown property" bug. Any chance this can get fixed ? It's much quicker than using slate. Submitted by Kurai on Sat, 2014-11-22 07:17. Really like this script. Very useful. But... like everyone else... I get an error message when using maps which also deletes all my previous Material tabs. Submitted by asymptote on Sat, 2013-05-04 02:19. Are there any plans to update this ? I'm still getting errors and problems. Submitted by rs3d on Thu, 2013-04-11 06:45. The Maps Bug posted by @Wilbert is dramatic sometimes... Might Marco or somebody else take a look? Submitted by asymptote on Sat, 2012-07-14 07:48. After weeks of no problems i now get this error, is it fixable ? Submitted by Wilbert on Wed, 2012-01-18 07:22. But could you please fix the maps bug ? It's an error that doesn't come up right away but after you've been working and switching for a while. Submitted by BJFisher7 on Fri, 2011-02-18 09:26. I use alot of materials so this is very useful, thankyou! Submitted by pytemp on Thu, 2011-02-10 08:22. Submitted by cecofuli on Tue, 2010-11-23 14:42. Forse ho trovato il bug.